Last week my super duper awesome hubby found a true bargain. He was able to get an wood playground for our kids off of Craigslist for only $50! I guess the family had like 10 other people interested in it, but they picked him because he was the most organized. When he contacted them he let hem know the hours he works, and when he would be able to pick it up ect. I am so proud of him for working so hard to get this for our kids (it took him 2 trips to Columbus and back). We had been wanting one since we built the house, but we just couldn't see spending $300-$500! Almost done. A fresh coat of stain and it will be good as new! Your the best daddy ever!! Enjoying an absolutely beautiful October day! Gauge going on his very first Hay Ride with daddy and grandma. Relaxing and soaking up some sun. Lots of great fun with great friends! That was a lot of fun mom, but I'm tired! That's awesome about the playground! You should post that for my Thursday's Treasures! 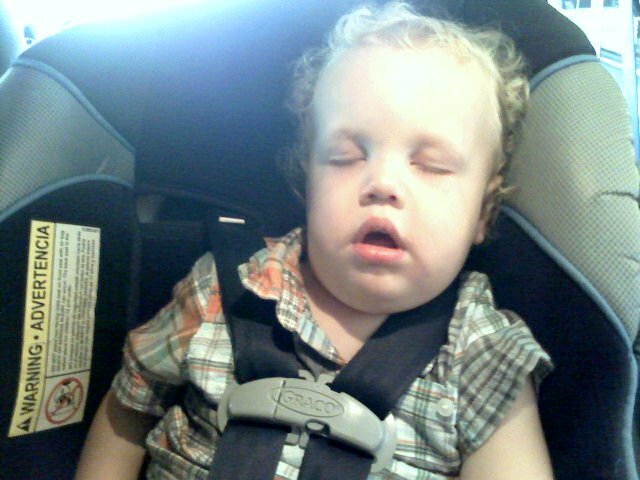 I totally love that pic of Gauge at the end, sacked out in his carseat- those cheeks and lips!! Yummy! What a good daddy and what a great deal. We had one at our old house and had to leave it behind when we moved, my kids really miss it. Hope your kids have many great hours of fun on it. What an amazing bargain!! Don't you love it when you find such a steal?! You have an adorable family. Thanks for your comment. Nice to "meet" you. Owhhhh i love the photo w/ the sky in the background, the colors are just beautiful!